The environment ministry will send a team to find out more about a ship of US origin anchored off the west coast near the Alang shipbreaking yard that allegedly contains toxic materials. Although the Gujarat Pollution Control Board, or GPCB, gave permission for the ship to anchor on 8 October, it has not yet given the go-ahead for breaking and salvage operations on the vessel. The state pollution board has conducted inspections and sent a report to the ministry on Wednesday, regional officer G.V. Patel said. “The ship shouldn’t have been given anchorage permission," said Gopal Krishna, convenor of the Indian Platform on Shipbreaking, an environmental activist group. 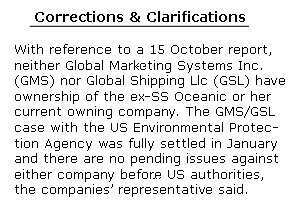 “The US EPA (Environmental Protection Agency) has barred the movement of the ship to developing countries and they should recall it..."
Platinum II is of US origin and a 29 January release by the US EPA stated that the then owners of the ship—Global Shipping Llc and Global Marketing Systems Inc.—have been fined about $1 million for alleged illegal distribution and export of a PCB-containing ship. The ownership of the vessel is under question as it was owned by a US company but later sold to a Liberian company. It is unclear how the ownership of the vessel was transferred to a Liberian firm and how its name was changed. The Times of India on Wednesday cited environment ministry officials, whom it didn’t name, as saying that they were inquiring into the ownership of the vessel.